As expected, the BBC has won its legal battle against blogger Tony Newbery. Newbery wanted the list of "scientific experts" who attended a BBC seminar at which, according to the BBC Trust, they convinced the broadcaster to abandon impartiality and take a firmly warmist position when reporting climate change. When the Beeb refused to divulge who these people were and who they worked for, Newbery took the corporation to an information tribunal. Now the names and affiliations of the 28 people who decided the Beeb climate stance - acknowledged by the Corporation to include various non-scientists such as NGO people, activists etc - will remain a secret. The case was heard on Monday and Tuesday last week; the BBC was represented by a team of five, at times six, lawyers, including lead counsel Kate Gallafent, a barrister at Blackstone Chambers. Newbery, who represented himself, was accompanied by his wife. The hearing included cross-examination of the BBC's director of news Helen Boaden. Newbery had asked for the attendance list in a freedom-of-information request to the BBC some 18 months after the seminar took place in early 2006. He had been struck by a disparity between the BBC Trust's description of the event - "a high-level seminar with some of the best scientific experts" - and subsequent accounts of the confab, which suggested the 28 invitees included a number of environmental activists and ideologues. Newbery wanted to know how many scientists were there, and what they said that had been so convincing. The BBC argued that it was able to derogate from the Freedom of Information Act because the seminar was held "for the purposes of journalism" and its attendance list is therefore protected by the law. And in any case, according to the Beeb's lawyers, the information didn't exist at the time of the request - despite its historic significance: the public-funded broadcaster has statutory obligations, under Royal Charter, to be impartial. The "purposes of journalism" get-out-clause has been used by the BBC on various other occasions as a cloak to conceal information requested by the public under the act. For example, the corporation has refused to disclose how much tax its commercial operation BBC Worldwide pays in the United States, and its US web traffic numbers, using the "purposes of journalism" catch-all. The speed of the verdict is a surprise - most deliberations take four to six weeks, but this took a mere ten days. However the verdict itself is less surprising: the Supreme Court earlier this year upheld the BBC's "purposes of journalism" derogation and supported its right to withhold an internal review, dubbed the Balen Report, of its Middle East coverage. Tribunal judge David Marks QC supported the broadcaster, cut off several avenues of questioning from Newbery, and agreed with the BBC that it can be considered a "private organisation", despite the fact that it is funded by a compulsory tax. The hostility of lay judge Alison Lowton, one of the three-strong panel, to Newbery was also noticeable - but perhaps understandable. The former director of legal services [PDF] of Camden Council took a six-figure severance package in 2007 when her post was abolished. Camden fought to keep the details of the settlement away from freedom-of-information requests. We asked the Information Commissioner's Office how a lay judge with such partisan views on climate change came to oversee hearings so closely coupled to the subject of climate. Campaigning lay judges would not normally be appointed to sit on such a case, a spokesman noted, and concerns would be legitimate grounds for appeal. Makanji was a councillor from 1982 to 2006 and sits on the boards of various quangos and charities, according to his tribunal service profile [PDF], including the Selby Trust, which makes grants to bodies promoting climate-change issues. These dissenters (or even sceptics) will still be heard, as they should, because it is not the BBC’s role to close down this debate. They cannot be simply dismissed as "Flat Earthers" or "deniers", who "should not be given a platform" by the BBC. Impartiality always requires a breadth of view: for as long as minority opinions are coherently and honestly expressed, the BBC must give them appropriate space. ‘Bias by elimination’ is even more offensive today than it was in 1926. The BBC has many public purposes of both ambition and merit – but joining campaigns to save the planet is not one of them. The report was ignored - and in the best tradition of a British bureaucratic establishment under siege, the Beeb simply dug in deeper. 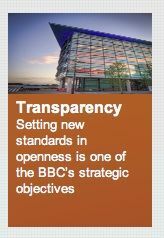 Our postbag reflects widespread disquiet from supporters of the BBC about the disparity between its declarations of intent on transparency, and the reality. A refusal to make itself accountable to the citizens only makes political meddling more likely - so by winning an expensive legal battle, it risks losing a rather more important war. Andrew Montford has written a 26-page guide to the seminar saga, and the subsequent Freedom of information battle: you can buy it in ebook format here for 75 pence.